Cumbria County Council's leader Jim Buchanan has died, just weeks after being diagnosed with bowel cancer. Mr Buchanan, 67, was at home with his family when he died on Thursday. He announced he would step down as leader last month but continued to represent Aspatria and Wharrels wards as a county councillor. Mr Buchanan, who was elected to the post in June 2009, led the authority during Cumbria's devastating floods in November last year. Council chief executive Jill Stannard said he had shown great skills as a leader and decision maker. She said: "It's extremely sad news. We are all stunned by how quickly Jim declined. "The fact that Jim was still working full-time as our leader just last month shows how strong he remained until the end. "He was a fighter, enormously respected by both officers and members, and he remained committed to improving services for Cumbrians." 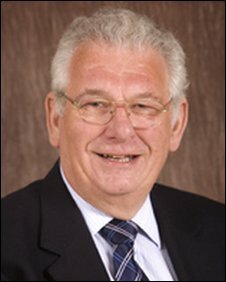 Mr Buchanan was first elected as a county councillor in 2005. Before that he was an Allerdale district councillor, and had also served as a member of the Lake District National Park Authority (LDNPA). Deputy leader Stewart Young has stepped in until the next full council meeting when a new leader will be elected.